Honey-Brined, Southern-Fried Chicken Breasts – Boneless, Skinless, Low-Fat, and Delicious? Is there anything less inspiring than a boneless-skinless chicken breast? There must be, but for the sake of this post, let's say there's not. So, how do we turn this culinary snoozer into something worthwhile? Fry it. Hey, that was easy. Of course, the problem here is there's no flavorful skin on which to attach a crunchy coating. To add insult to injury, the fatty skin also protects the bland breast from drying out. Despite these obvious issues I decided to attempt Southern-fried boneless-skinless chicken breasts anyway. As fate would have it, the same day I bought the chicken, Alton Brown was doing a honey-brined pork shoulder on Good Eats. To combat the dreaded dry chicken I decided to use a simplified variation to soak my breasts. I won't bore you with all the scientific details, but through osmosis, brining raises the internal temperature at which the moisture is forced out of a protein. Even though I only brined my breasts for an hour, it worked like a charm. As you'll see in the recipe video, the meat was very juicy. As far as the skinless-coating went, I was also pleasantly surprised. Even though it was incredibly thin, it stayed on the meat throughout the frying, and the final result was nothing short of quite good. And yes, I am calling this low-fat (relative to regular Southern-fried chicken). When you eliminate the skin, you significantly reduce the calorie count, and even though we're cooking this is lots of oil, the coating is too thin to absorb very much of it. If frying isn't your thing, still I encourage you to give this ultra-simple brine a try anyway. I think you will be impressed with its effect. I plan on using this on a regular basis this summer while rocking the grill. Enjoy! When I first discovered arepas on a trip to New York City last year, it was love at first bite. I couldn't wait to get back to San Francisco, find some P.A.N. arepas flour, and make a batch or two, which I did in this post. Since it was my first attempt, I used the classic water, salt, white cornmeal mix to delicious effect. As I read more about arepas, I saw there were hundreds of variations, using all sorts of combinations of milk, cheese, cream, buttermilk, yogurt, etc. I decided I wanted to try a breakfast version made with cream cheese and milk, topped with butter and honey. Unfortunately, I never did. So, when my friends at Imusa asked me to test their arepas maker, I knew exactly which recipe I'd try. As you'll see, this machine was very easy to use, and produced some fine arepas (even though my dough was a tad dry and cracked a little – and to paraphrase the great Whitney Houston, when it comes to arepas perfection, cracks are wack). If you don't use a specially made grill for these, worry not; they would come out fine using a pan as I did in the original video. If you want more info about this particular model arepas maker, please check out this Imusa product link. Also, if you can't find the P.A.N. arepas flour in a store near you, follow this link to purchase online. On a side note; I have to admit, as I was using the machine, I kept daydreaming about doing burgers and eggs with it as well. So, don't be surprised if you see this machine appear in future videos with alternative recipes. Enjoy! UPDATE! As viewer AFB just brilliantly pointed out, you can certainly just place your dough balls in the maker and let it press them down into patties for you. This is, of course, the main advantages of using this machine! I like the smoother edges hand-shaping provides, and I did make sure they were thicker than the press is deep, so that both sides are in contact. I may do an updated test to see how this faster and more traditional use of the press works. Note: This video was made possible by Imusa, and the arepas maker was provided free of charge to test. Remember when I posted the "Potato Ball in Potato Box" video, and you guys started joking around about deep frying it? Well, here you go! This was a YouTube video response from kashioable. The duck breast we did in Episode 1 of our stovetop sous vide series last month was so spectacular, I couldn't wait to give it a try with some nice thick steaks. I had no doubt that it would work (thanks to the laws of physics), but would the extra time and attention be worth the payoff? Well, that depends. As far as the taste and texture of the meat goes, it was pretty much the same as any perfectly cooked steak I've ever had. Not to sound all braggy, but thanks to having done thousands of them, I can produce a pretty decent, medium-rare NY Strip steak in about 15 minutes. It will be nicely browned and crusty outside, warm and pink in the middle. So for me personally, I'm not sure the extra wait is worth it purely for the textural advantages is provides. Don't get me wrong, the results were fabulous, but do I really need to wait 2 1/2 hours to get my beef on? The real advantage to this technique is not a superior-quality final product (like it was for the duck), but the fact that you're guaranteeing a perfect medium-rare (using 130 degrees F. water, or 140 for medium, or 150 for medium-well, etc.). So, if you've never had any luck getting large, expensive hunks of steak cooked to your idea of perfection, then this is the way to go, for sure. Since we went over the basics of this procedure in the previous post, I won't rewrite all the background info about what sous vide is, and how it works. For that kind of scintillating background information, please check out, "Episode 1: The Best Duck Breast Ever." Enjoy! NOTE: For LOTS more information about doing sous vide steaks, check out Sous-Vide 101: Prime Steak Primer by J. Kenji Lopez-Alt, posted on Serious Eats. What is the Opposite of Meatless Mondays? This is "Meat Salad" from the YouTube channel, Epic Meal Time. I would LOVE to know what you think. Enjoy! UPDATE: We have an official Vegan response video below! This great pie crust video features Alan Carter, the pastry chef at Mission Beach Cafe, a great little neighborhood restaurant just a block away from our home in San Francisco. I've been planning on filming a new pie crust recipe, and have always wanted to try the vinegar/water method. Knowing that our neighbor, Chef Carter, known for his world-class pies, uses that same technique has me very excited to give this a try. The clip comes via The Feast, who credit Mike Anderson, from NBCBayArea.com, for the video's production. Enjoy! Spicy Orange Chicken Wings - It's Not a Party Until the Panda Wings Come Out! Here they are – easy and delicious, spicy orange chicken wings, cleverly named (according to me anyway) after the spicy orange chicken served at Panda Express. By the way, this recipe has nothing to do with killing, riding, eating, rubbing, growing wings on, or otherwise abusing panda bears. We are right smack in the middle of chicken wing eating season, and with the Super Bowl just around the corner (Go Jets! ), I figured it was high time for a new wing fling. The recipe could not be simpler to make, and if you can somehow manage to whip up a batch of these oven-fried chicken wings to glaze, you'll be in sticky-finger-heaven. Since this was my first time trying this, I went very basic, and was extremely happy with the results. It was very similar in taste and texture to the Panda orange glaze, and done so with no gloppy cornstarch, which is not very nice cold. Next time I will try the additions of ginger and garlic, and maybe some toasted sesame seeds. In the meantime, I really hope you give these a try, and please let me know how your particular variations come out. Enjoy! I'm about to air a video for, "Panda Wings." As the name suggests, this will be another fabulous addition to our award-winning collection of chicken wing recipe videos. The "panda" part comes from the fact that the spicy orange glaze you see glistening here, is inspired by the most popular entree at the popular Chinese fast food chain, Panda Express. So, can I use this name? Will I get letters from their lawyers? Are you a trademark attorney, or at least play one on the Internet? I'd love to hear what you think! You know I try my best to keep this blog free of politics, religion, and other subjects we all agree aren't as important as food, but on MLK day, I make a small exception. This is the end of the famous "Dream" speech. If for some reason you've never seen this, it's probably one the greatest speeches ever filmed, and a must-watch. Even if you have seen it, hopefully it never fails to inspire. Enjoy! I forgot I promised to post the video for the simple peach sauce I used to drizzle over the duck breasts in the stove-top sous vide recipe. I've done sauces similar to this in the past, but used the term gastrique to describe them. Technically, a gastrique starts with caramelized sugar, to which sugar and fruit juice are added, but for my purposes here in Food Wishes land, it was close enough. So, while I was putting this quick and dirty clip together, the working name was "peach gastrique." Then I remembered I'm not French, and most likely neither are you. At that point, I decided to simply call it a peach sweet and sour sauce. What it lacks in pretentious French cooking lingo-ness, it more than makes up for in accuracy and approachability. Beyond semantics, there really is no recipe here, but more of a ratio. One part vinegar, two parts peach preserves, three parts chicken broth, plus whatever seasonings. Boil, reduce, and serve – and of course, enjoy! salt and fresh ground black pepper to taste, depending on what you are serving it on (mine didn't need any, since I was serving over nicely salted, crispy duck skin). We did it! I'm proud to announce that I've returned from Hollywood, Tasty Awards trophy in hand! It was a very long, short two-day trip, so I'm going to keep this brief. I can't thank you all enough for taking the time to vote. Every single time I've asked for support with a contest or award, you faithful foodwishers come through like champs. It's one of the oldest clichés in the business, but it's so true, without the audience, there is no show. I met some amazing new people, and got to visit some dear old friends. Speaking of friends, I have to give a big shout out to my buddy Sara (aka Average Betty), who won the 2010 Home Chef award, and was nominated in more categories this year than any other show. Unfortunately, she was robbed, but it was an impressive showing nonetheless. Los Angeles was a lot of fun, but I'm excited to be back and cooking in chilly, not-quite-as-glamorous San Francisco. Thanks again, and stay tuned for a bunch of new videos airing soon! 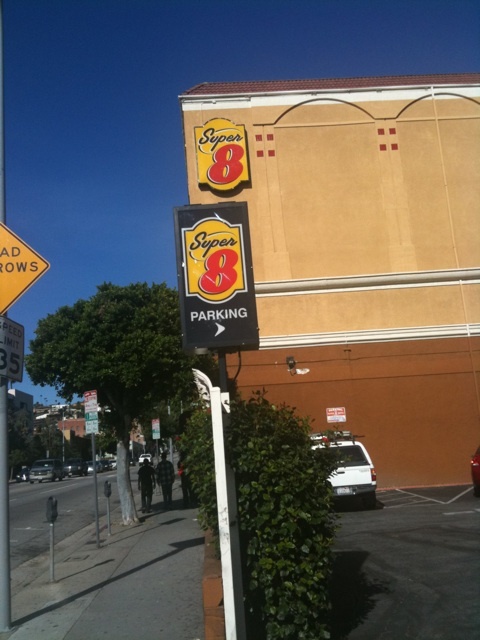 I'm in glamorous Hollywood, CA (pictured here is my glamorous hotel), for the Tasty Awards. You can read about exactly what that is here, but I wanted to post a quick note to let you know I'll be here until Friday, so please pardon me if I'm not able to respond to an email or comment. Cotechino - Happy New Year All Over Again! Cotechino is a large, Italian pork sausage traditionally served to celebrate the New Year. Indigenous to Modena (yes, that Modena – home to the great balsamic vinegar), its thick casing is pierced all over with a knife, after which it's gently braised in a pot of lentils until done. Sound good, right? But wait, there's more. After the sausage is cooked, it's sliced into round "coins," which are then fried crisp in a pan, and used to garnish the lentils. Everything about this recipe sounds great, so when Michele and I happened upon a nice, fat cotechino in Chris Cosentino's Boccalone, in the San Francisco Ferry Building, I knew the cranberry bean and Swiss chard soup I was making that day was going to have a guest star. As you'll hear me whine about in the video, a huge rainstorm hit the city right in the middle of the recipe, and I didn’t make the correct adjustments to the camera. I tried to lighten the film, but it still looked horrible, so most of the soup making part of this is not shown. Here's what you missed: I made bean soup, and wilted some Swiss chard in it. That said, this post is not about the soup, it's about how to use the cotechino. The exact same procedure shown here in all its dimly lit glory, can be used for almost any vegetable or bean soup/stew. I loved it with this simple cranberry bean ragout, but will try it with the traditional lentils next time…even if I have to wait another year. Enjoy! I grew up around snow. Actually, I didn't just grow up around it, I grew up in it, on it, and under it. So, when I saw this video from Chef Jason Hill on how to make snow ice cream, I was kind of upset I had never done it. I'm not usually one of these "blame your parents" people, but in this case, I really have no choice. 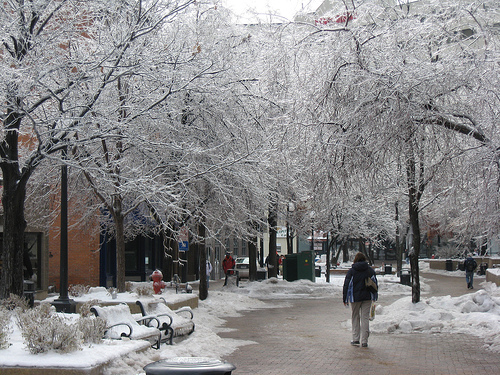 Why didn't we make snow ice cream? Mom? Anyway, I'd love to hear from anyone that's tried this dessert, and what your experiences were. Of course, I don't have to tell you (but will), this is not something we're doing downwind from the old tire factory! You'll need to find pristine, freshly falling snow to attempt this. Enjoy! There's one thing I learned a long time ago; if you add a little cinnamon to a savory recipe, you are allowed to describe it as "exotic." That's just the way it works. And really, who doesn't need a little more "exotic" in their lives? As far as the easy part, well, that is a more relative term. There are no difficult techniques here, and after cutting up an eggplant and onion, most of your prep is done. The only step that one would describe as "not easy," would be the shaping of all those little meatballs. Eating little lamb meatballs is fun, but it does take a while to portion them out. Happily, I've included a top-secret restaurant trick for making lots of small meatballs very quickly, by using your hand as a sort of extruding device. Spoiler alert: it's pretty vulgar (but highly efficient). By the way, this lamb meatballs recipe video was done as part of a special feature my friends over at The Daily Meal are doing. 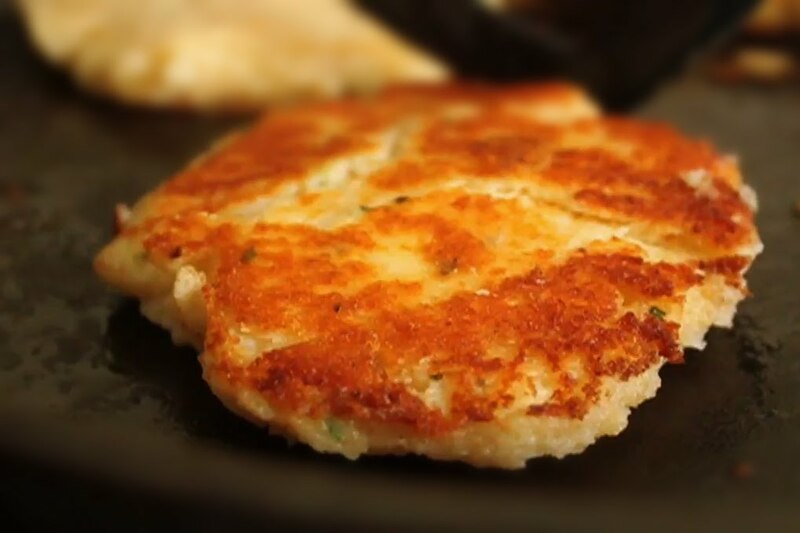 Once a week they have something called "Recipe SWAT Team," where they tackle a new ingredient with one goal in mind: creating easy and delicious dishes. This week it was "Recipe SWAT Team: Meatballs," and I was asked to throw on my bullet-proof vest, grow a mustache to look more like a cop, and bust through the door both barrels blazing. You can check out the entire feature here, and see some other great meatball recipes. I hope you give this delicious lamb and eggplant recipe a try soon. Enjoy! If you watch any food television at all, you've undoubtedly seen the "sous vide" (French for "under vacuum") technique many, many times. What was once a very unique procedure is now about as rare as a hung-over line cook. Not so long ago, only a handful of pros using state-of-the-art sous vide set-ups, costing thousands of dollars, got to play this game. Today, there are many options for home sous vide kits, most costing hundreds of dollars, but what about the home cook who just wants to try this once and a while, and doesn’t want to invest that kind of money and space? How about a simple, almost foolproof, stovetop sous vide method that requires no special equipment? Too good to be true? Well, I'm happy to report it's so very true, and produced what Michele and I agreed was the best duck breast we've ever had. The principles behind this sous vide duck breast's succulence is quite simple. Put the meat in a watertight, vacuum-sealed bag, and place it in a water bath held at a temperature exactly equal to the ideal desired internal temperature. After a certain amount of time, the meat reaches that temperature and stays there. That's it. Not only is there no real danger of overcooking the meat, but it cooks so gently, in a vacuum, that virtually no moisture is lost. The only real difference with our stovetop sous vide and the professional set-up, is the vacuum part. We're going very low tech here; simply pressing or sucking the air from a ziplock bag. It's not a perfect vacuum, but as you'll see, it doesn’t have to be. As long as your package sinks below the surface, and no water gets in, you're good to go. After an hour in the 135 degree F. water, my duck breasts were picture perfect inside. I crisped-up the skin, drizzled over some sweet and sour peach sauce, and ate in stunned silence. I could not believe how amazing the texture was. I won't even waste time trying to find the adjectives, as most of the ones I need haven't been invented yet. I've only done this with one other meat (a NY Strip steak, also very impressive) so I can’t give you any info on other recipes/times/temperatures just yet. I will, however, post the quick and easy peach sauce seen in this clip soon. Anyway, I really hope you give this spectacular sous vide duck a try. Enjoy! Some of you may remember my trip to Little Rock last October, where I filmed a series of eight snack videos for Kellogg's Snackpicks.com. It was a really fun trip, and I had a great time working with an amazing team of producers. This quick and easy Deviled Shrimp Bites is the first recipe to air. The video is very straightforward, but I will offer one additional tip. Be sure to use the best shrimp possible. If you are buying them cooked, they need to be fresh and sweet! 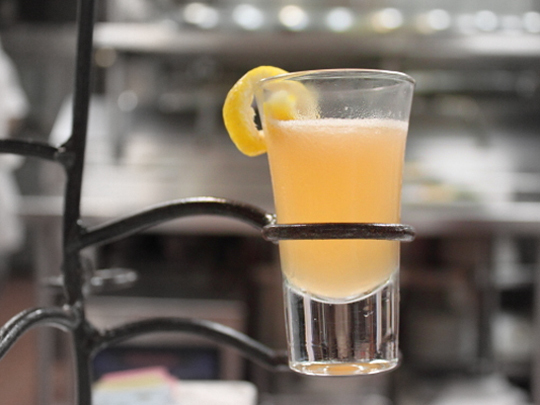 Better yet, buy raw shrimp and follow the poaching technique in this shrimp cocktail video. Be sure to head over to Snackpicks.com, to get the written recipe with ingredient amounts, as well as many more great snack ideas. Enjoy! What a truly amazing food year that was! I worked, played, and ate in 10 different cities, and enjoyed over 200 professionally prepared meals, many created by the country's top chefs. So, you'd think with so many options, choosing a "Meal of the Year" would be difficult. Well, that's not the case. In fact, it’s a total no-brainer. And by brain, I actually mean pants. That's right, my meal of the year came as a direct result of not wearing pants. I'd love to explain. This all took place on a press trip Michele and I attended, hosted by the New Orleans Convention & Visitors Bureau. 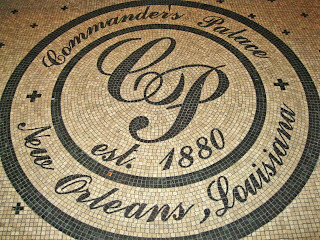 We had been invited down to experience New Orleans' cuisine and seafood post BP oil spill, and since neither of us had ever been before, we jumped at the chance. We had already enjoyed several days of incredible food, drinks, and music in the French Quarter, and the trip was to culminate in the Garden District with a special brunch, prepared by three of the city's star chefs, at the venerable Commander’s Palace. 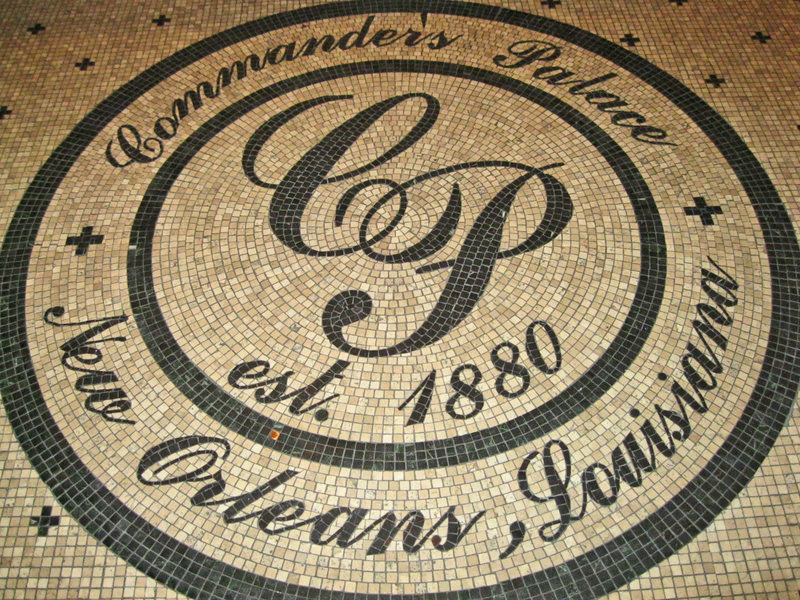 For those of you that don't know, Commander’s Palace has been considered one of New Orleans' finest restaurants since it was built in 1880. 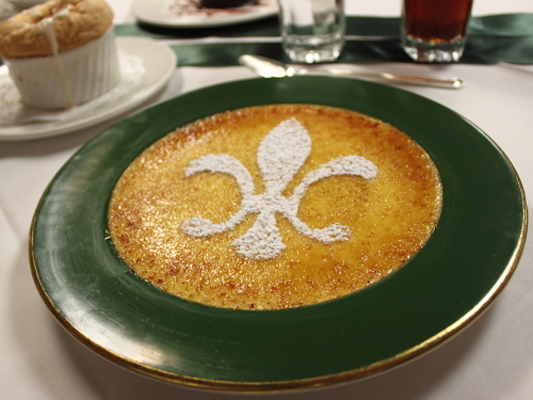 A who's who of great chefs have passed through its bustling kitchen, including Paul Prudhomme and Emeril Lagasse. This day it would be Executive Chef, Tory McPhail (tall hat) teaming up with Donald Link (ball cap) from Cochon, and Matt Murphy (right) from M Bistro at the Ritz Carlton. I was really, really looking forward to this meal. 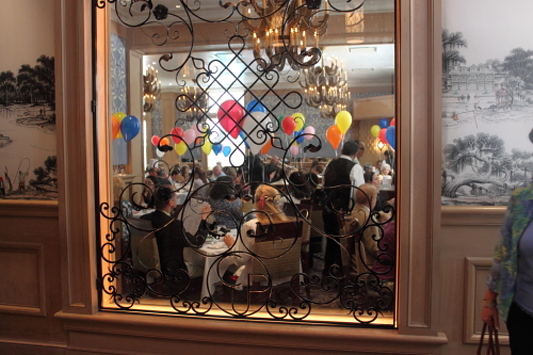 As we waited to be seated, I stared hungrily into the colorfully decorated dining room. The smells were glorious; the scent was some sort of sweet, smoky amalgamation of bacon and butter. I was shaken from my trance as our group was led forward toward the source of these heavenly aromas. Suddenly, I felt a tap on my shoulder. It was co-owner, Ti Adelaide Martin, and she asked if I could step aside and let the others pass. I did, to quizzical looks from my fellow media members. Then I heard something I'll never forget, "I'm sorry," she said with a stern smile, "we can't let you into the dining room without pants." It was true. I was not wearing pants. I was wearing shorts. If you've never been to New Orleans in August, let me tell you, it's very humid, and very hot. People say things like, "it may only get up to 95 today." So, since it was brunch, and hot enough outside to accidentally make roux, I decided to go with a nice pair of khaki dress shorts. 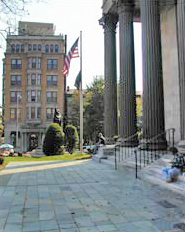 She politely explained to me, and the completely horrified PR rep who had made the plans, that everyone who makes a reservation is told about the dress code, and that in the 130 year history of the establishment, no one has ever been allowed to enter the dining area sans pants. Clearly, my "don't you know who I am?" was not going to work. My heart sank. Talk about a swift kick to the beignets. Michele and I were starving, and crazy with anticipation, and it would have been 30 minutes each way to go back to the hotel. 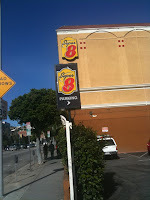 Not only that, all our luggage had already been packed for the return trip to San Francisco following the meal. Since everyone was flying out after this event, I had no intention of keeping the other press members waiting. The only option would be to return to the Ritz-Carlton to change, thereby missing out on the first half of the menu. Then, just as my exposed knees and I were about to leave in shame, I was introduced to the true meaning of Southern hospitality. Ti told us that while I would not be allowed to enter the dinning room, she had checked with the kitchen, and they were fine with setting up the Chef's table. I was told this is the hardest reservation in New Orleans, with people calling up to a year in advance. Out of sheer luck, they had decided to not book the table that morning, since the kitchen was hosting the aforementioned visiting chefs. Michele and I looked at each other half-smiling, in total disbelief at our good fortune. A few seconds later we were seated smack in the middle of the most famous kitchen in New Orleans. A few friends from the press group came down to check on our situation, but as soon as they saw where we had landed, their looks of concern quickly turned to envious bemusement. What followed was a brunch as magnificent as the setting, and as magical as the strange chain of events that led us to it. I hope you enjoy the photos, and enjoyed the story behind them. 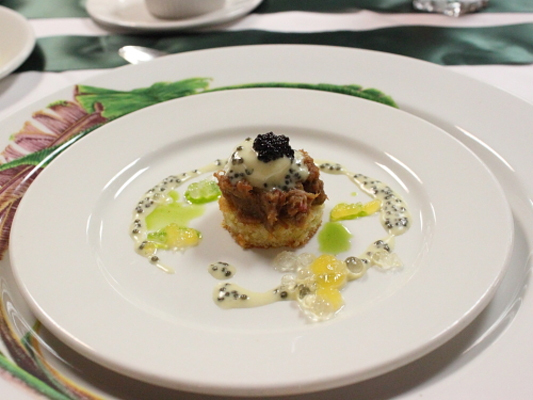 Executive Chef, Tory McPhail, started things off in grand fashion with an amuse bouche of sweet corn Johnny cakes, pulled pork, soft poached quail egg, Atchafalaya river basin caviar, lemon and champagne gelee, hollandaise, and Louisiana sugarcane. 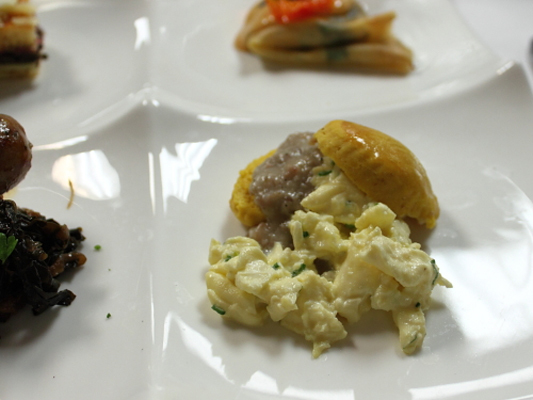 McPhail is known for his creative interpretations of classic Louisiana cuisine, which he reminded us was "the original fusion cuisine." Chef Tory prides himself on finding the very best local ingredients, and almost 90% of what's used in the restaurant comes from within 100 miles of the back door. 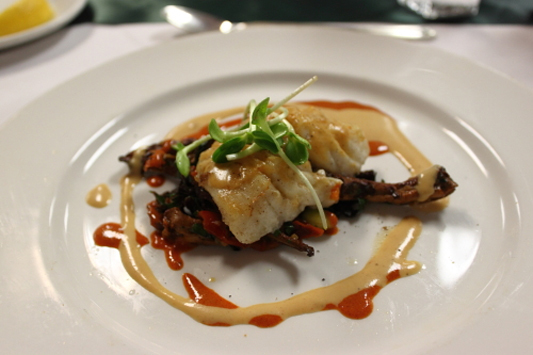 The benefits of such practices were as obvious, as they were delectable with this butter-roasted grouper with chanterelle mushrooms, Louisiana soybeans and crushed local blue crab bisque. 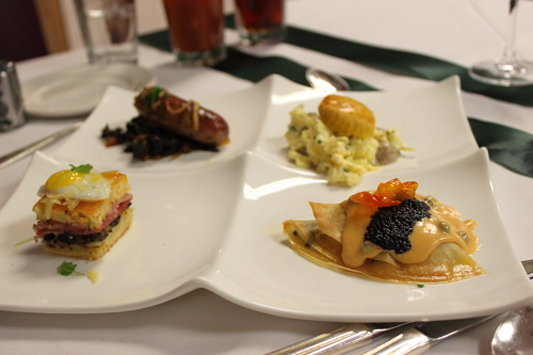 Chef Matt Murphy offered a “Veux Carre Brunch.” One gorgeous plate composed of four fabulous dishes. 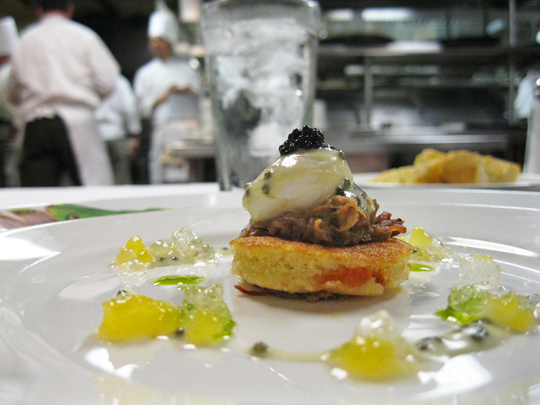 We had already enjoyed several examples of Chef Murphy's culinary skills at M Bistro, in the Ritz Carlton, so I was looking forward to seeing what he would come up with for this special menu. He did not disappoint. 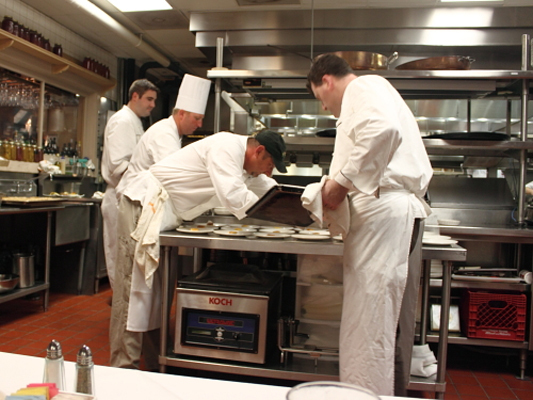 By the way, in yet another twist of bonne chance, assisting Chef Murphy was Sous Chef Bradley McGehee (pictured above, far left), a former student of mine at the CCA! It was great seeing him again, and I'm glad he is getting to work with such talented chefs. 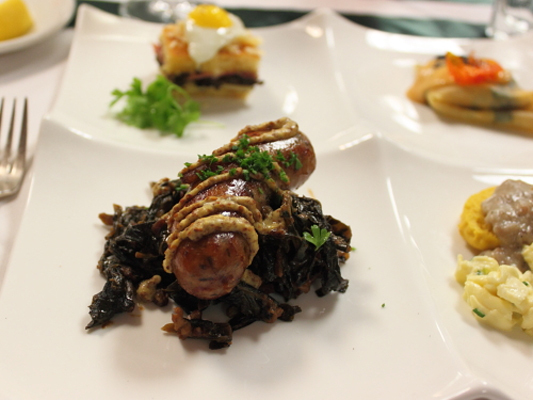 Donald Link, the James Beard Award-winning Executive Chef at Cochon, offered a hearty, Cajun change of pace to the "haute Creole" we had been enjoying, and presented a Sausage and Oyster Pie with Parmesan Bechamel and local Padrone Peppers. 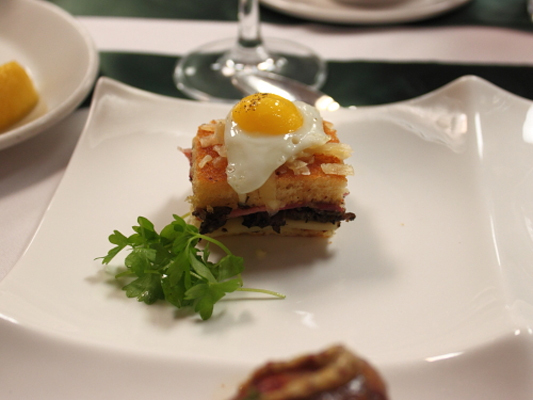 There was nothing light about this dish, except how it made you feel while you ate it. Not only did we get the all this amazing food, prepared and served by these world-class chefs, but we also were blessed with several signature cocktails, like this "Tequilla Mockingbird." In addition to being brilliant at finding tables for people without pants, Ti Adelaide Martin is also an accomplished mixologist. Speaking of tequila, halfway through brunch, and for no apparent reason, these guys walked into the kitchen and played this to the cooks. Would I be using the local term "Lagniappe" correctly to describe this? As the meal came toward a close, Michele and I discussed how we could tactfully pass on dessert. 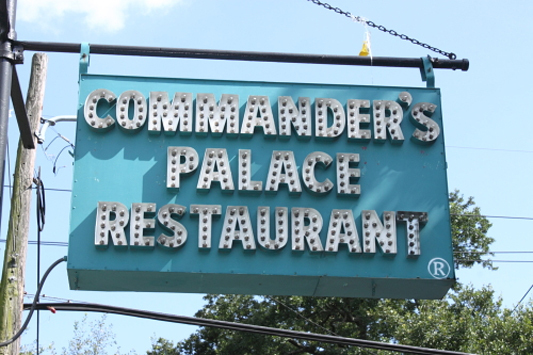 We knew Commander’s Palace was known for its decadent desserts, but we were full…and not regular full, New Orleans' full. We decided we'd just split a plate of something, so as not to insult our hosts. When we informed the server of our plan, she formed a smile as slow and sweet as molasses before simply saying, "No, that's not going to happen." 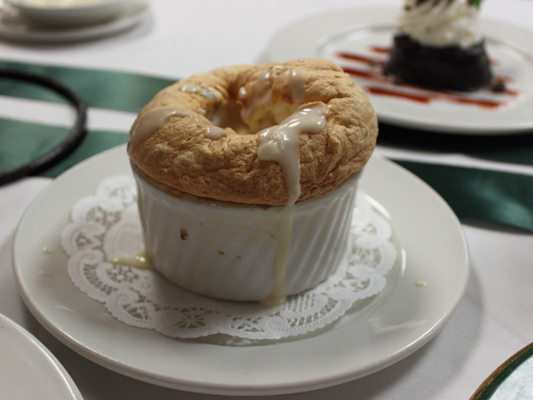 She returned with a tray containing full orders of five of their most popular desserts, including a classic Crème Brulee, and a you-have-to-try-it-before-you-die Bread Pudding Soufflé. From the depths of under-dressed despair, to the ecstasy of the ultimate Chef's table, this had been an experience we'd never forget. What a meal, and what a memory. A huge merci beaucoup to Commander’s Palace for a truly extraordinary brunch, and to Chefs McPhail, Link, Murphy, and McGehee for letting us share their kitchen! 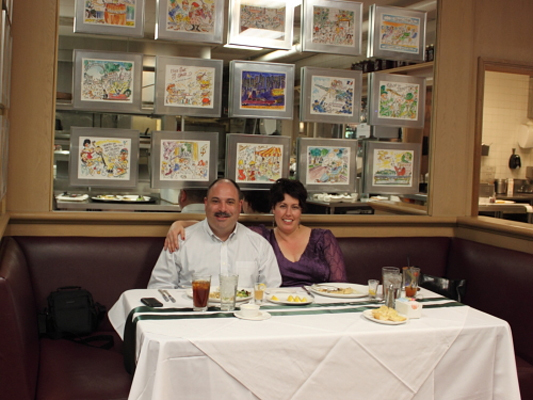 Just wanted to say Happy New Year to you all, and share what Michele and I enjoyed for our final meal of 2010. 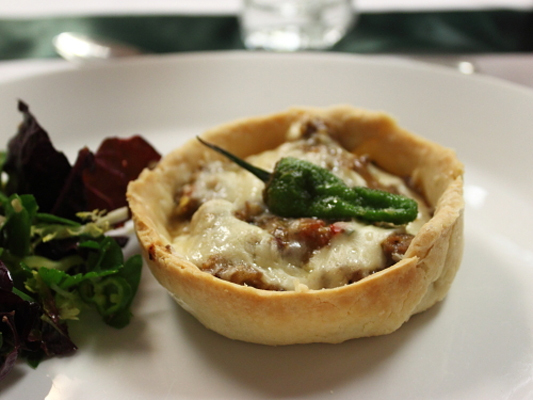 The first course was a superb Moroccan-style chicken crépinette seasoned with preserved lemon from Fatted Calf. 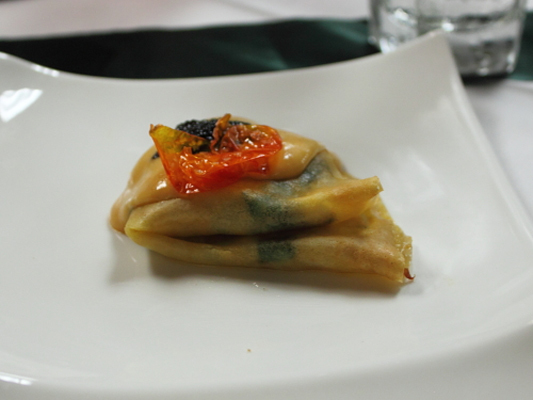 I served it over a salad of raw, shaved asparagus, and garnished with kumquats candied in a chili syrup. For our main course I continued my exploration into equipment-less sous vide, which produced the finest duck breast I've ever eaten. I served it with a huckleberry gastric, and green lentils, The meat was perfect beyond description. I can't wait to show you how amazing and simple doing sous vide cooking at home actually is. Stay tuned! Thanks to J. Kenji Lopez-Alt over at Serious Eats for his "Sous-Vide 101: Duck Breast" post, which served as the guide for the duck technique.